We've had a better week, now that everyone is feeling healthy again! The weather turned cold again, so the boys have been a bit cabin-fevery. Chewie has been getting some extra video games time with his dad, and so Artoo and i made some cookies together. The cutest little pastry chef! We are all anxiously awaiting spring, though. Almost every day Chewie will ask me how many days until Spring, or Artoo will ask "Why is it STILL Winter?" and all i can tell them is: "We live in Saskatchewan, who knows when Spring will come... but it will. Eventually." I love how much they love each other... You can see in Chewie's hand, he's holding a book. He was reading to his little brother in the upstair hall before i took the picture. Artoo had a busy week with therapies - as we're trying to make sure we're on track for Kindergarten (WAHHHHH!!!) We also stopped in at his Opthalmologist for a quick check up before we head to Calgary this month to see the surgeon. In between all of this, i've been trying to do a bit of my own personal art - taking 5-10 minutes here and there to get into my studio. I got some painting done this weekend, and painted Chewie's favourite stuffie, Maynard. 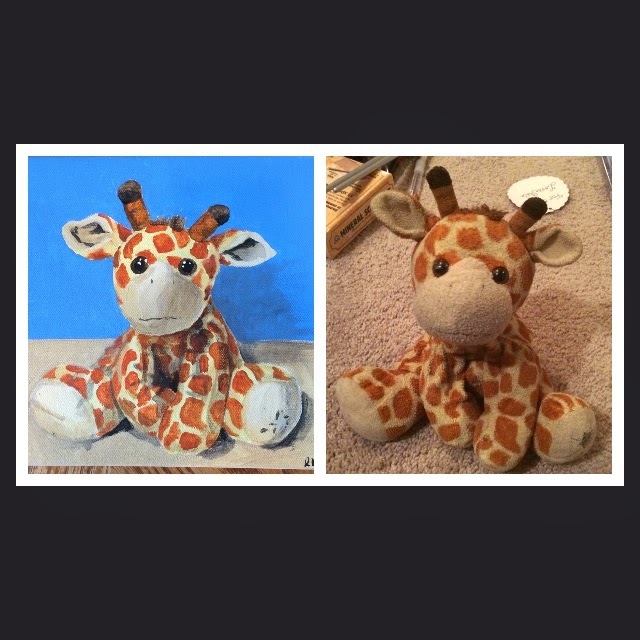 The boys both gifted me with 8"x8" canvasses, acrylic paints, and brushes for Christmas - and included a card asking if i would paint their stuffed animals. I managed to do Artoo's frog, Roger, on Christmas Day, but haven't gotten around to Chewie's giraffe. I'm not sure who coined the term Valentangle, one of the other CZTs i think - but it's so cute. With Valentine's Day just around the corner (HINT: it's Saturday) this week's challenge is to get into the Valentine's Spirit. You can use a heart as your string, or tangle hearts, or use the colours red white or pink... whatever tickles your fancy! Here's mine. I really quite like it. I don't use my zendala tiles often enough, they are really quite fun. 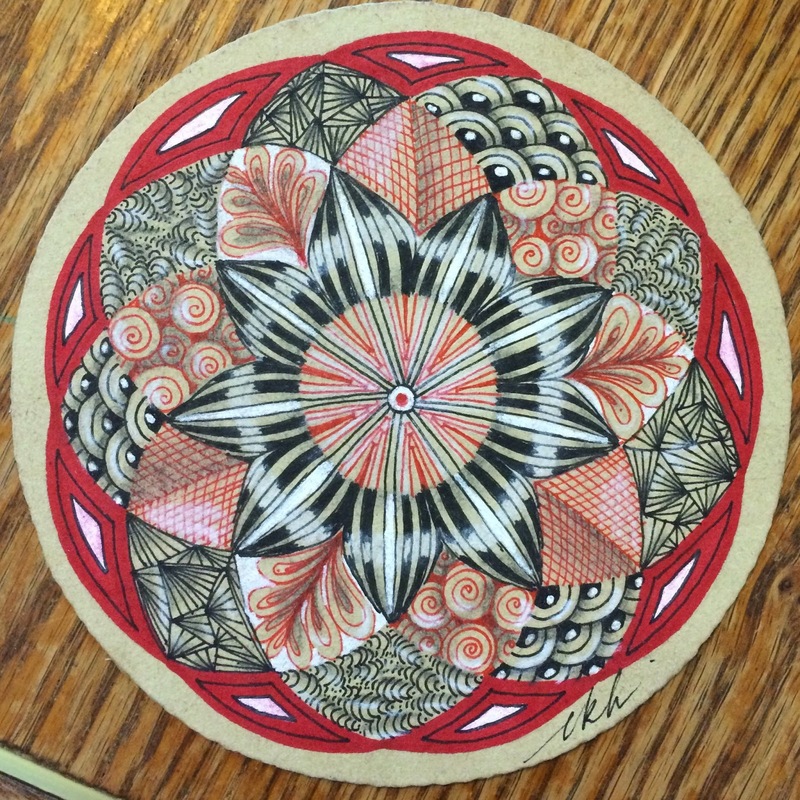 I used a renaissance pre-strung zendala tile, a red Sakura Identi-pen, Sakura Micron Pigma pens in black and in red, a white Sakura Gelly Roll pen, and my pencil and white charcoal pencil for shading and highlighting. I love that you are painting your boys' buddies. I love giraffes. Did you already post a photo of Roger and the painting you did? If so I don't remember, and I would love to see it. I can't imagine living where you have to be cooped up for so long each winter. You must have to make a lot of cookies LOL! Your Zendala is gorgeous. Love the colors and the design. Happy Valentine's day to you and yours. I'm with Chewie: My favorite stuffed animal (after Tony the dog who I had as a kid) is Henry the Giraffe. Because....GIRAFFES! Whatr a beautiful zendala! Thank you again for your challenges, they're so much fun! Have a wonderful week with your two little heroes. I had to delete your tangle from my head, because I was very inspired by... All my good wishes to you and your familiy and a pink valentine's day! I am glad to hear everyone is on the mend. Just when I start to feel miserable and cranky because it's never going to be spring here in Western NY either.... I remember its' colder there and then at least I know my misery has company. I am also a huge fan of giraffes and really enjoyed the challenge this week! I love your Zendala! Thanks for the inspiration! Your zendala is gorgeous, I LOVE it!!! I also love the giraffe, well done!!! I love hearts! I love your Zendala, it is beautiful! Thank you for making me push myself! Hi, Laura. Love your Zendala. Just in time to create Valentine Cards for my Loved ones. Love your zendala! I also love hearts, so this challenge was great. Happy Valentine's Day to you and your family, Laura! We love it! It´s so beautiful! The way you shaded the central motif of this zendala is stunning! LOVE the colors too. I would like to try one of these ...maybe I'll have time soon. Beautiful work this week. Inspiring. There are some sad people. I salute them. Hi Laura! Love your Zendala this week. Glad to see the family is on the mend. Happy Valentine's Day to you and the family. What a beautiful and inspirational piece you've done this week! Thanks for the challenge and have a lovely Valentine's Day. Your tile is just beautiful. Those colors work really well on the Renaissance tile. Your Zendala is great. The highlighting really brings things out. I think sometime the color red can be overpowering in a piece. Your combination of the colors does not let this happen. Happy Valentine's day to you and yours. As always, your tiles are really beautiful. Such a beautiful tile! Happy Valentine's Day! This is my first time entering as I'm a newbie. 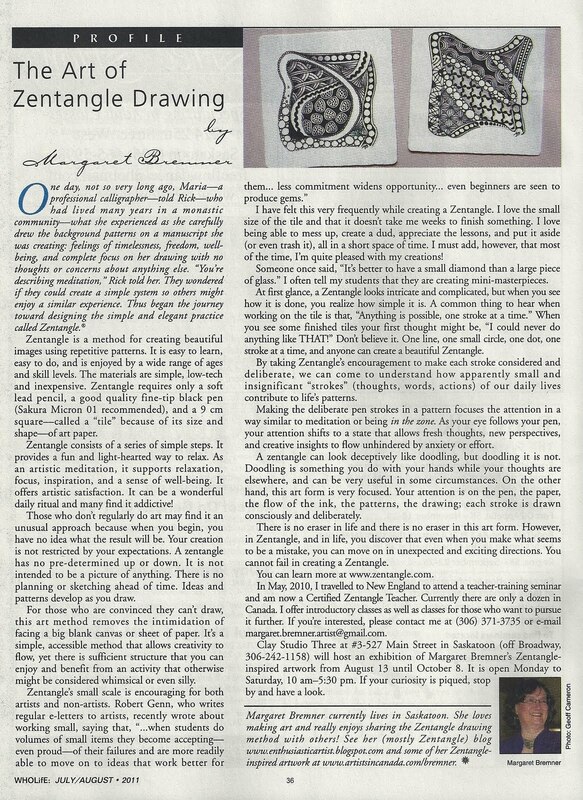 But it just so happened I decided to take a break from working through "One Zentangle A Day" this week and a local friend with whom I started learning this art form threw down the gauntlet for me to use paradox in a heart. So I did! :-) I hope you like it. Happy Valentine's Day, Laura, to you and your whole family. God Bless! Absolutely beautiful zendala Laura! I've always been intimidated by all the intricate zendalas I've seen. But with this challenge I decided "how hard can hearts be??" Well, now I'm hooked on zendalas! It was so much fun!! Thank you to everyone for their inspiration! .....Deanne B.
Gorgeous Zendala, Laura. I know Valentine's Day is already over out your way, but there's still a few minutes left here, so Happy Valentine's Day.